Last month’s column was a list of my favorite orchids, but since cattleyas are my favorite group, I’m devoting a whole column to them. With over 500 mature cattleyas in my collection it is difficult to choose favorites. However, here is my short list. My all time favorite is C Penang ‘Black Caesar’. This hybrid between C bowringiana and C Nigrella is extremely vigorous and produces a large head of 3”deep purple flowers every fall with an extremely sweet fragrance. The fact that it is a 40+ year old hybrid is testament to the skill of hybridizers of the day. Another deep purple cattleya, but with very large flowers and a sweet fragrance, is Blc Chia Lin, a Blc Oconee hybrid. This is a more recent hybrid with a number of nice clones available as mericlones and is (in my opinion) the zenith of dark purple hybridizing. Bright yellow cattleyas have always been my favorite, but are poor growers in my very hot, southern greenhouse. The exception is Blc Toshie Aoki, which originated in Hawaii. There are several different clones in my collection because I have not been able to decide which I like best. Some, like the clone ‘Pokaii’ have dark red-purple tips on their petals, while others are pure yellow with red lips. All are very fragrant, last a long time and grow extremely well and pass these traits to their offspring. Semi-alba hybrids have always intrigued me because they have an unusual combination of genetic characteristics; no genes for pigment in sepals and petals, but also a colored lip. This color form of cattleya hybrid has lagged behind others, and few really good clones have come along with this color combination, good form, and relatively flat flowers. The exception is Lc Melody Fair ‘Carol’, a product of a cross with C Horace. Most of its siblings are light lavender. A second favorite in this type of cattleya is Lc Mildred Rives ‘Orchidglade’. Anyone that has ever attended the Miami Orchid Show has seen many specimen-size plants of this hybrid. While there are many spectacular white cattleyas, my favorites remain some of the first modern white hybrids, notably C Bow Bells and C Bob Betts, many clones of which are still available. One white species that will always be in my collection is C trianaei ‘Aranka Germansky’, not only because of its place in orchid history, but because it is such a vigorous and beautiful orchid. All of these cattleyas quickly make specimen plants and their fragrance fills the greenhouse when they are in bloom. There are many lavender cattleyas in my greenhouse. One of my favorites is C Horace ‘Maxima’ along with its hybrids. However, in this color form it is the cattleya species that are my I love most. C trianaei ‘A.C. Burrage’ and ‘The President’ are equivalent to most hybrids and grace the greenhouse all winter, while clones of C mossiae do the same in spring. There are more clones of C schroederae in my collection so it must qualify as a favorite. 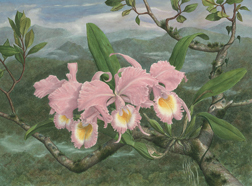 The delicate, light pink color, as well as a distinctive, pleasant fragrance distinguish this species from other better known species. Flowers appear delicate, almost paper thin, yet last 6 or 7 weeks. Summer in my greenhouse is dominated by large-growing bifoliate cattleyas most notably C leopoldii. This sweet-smelling species alone would be enough for me to maintain a greenhouse no matter what the cost. Finally, my one favorite small- statured cattleya is Slc Final Touch ‘Mendenhall’. Even though it has little fragrance, it has large, flat flowers of apricot-orange. Best of all, it flowers several times a year and the color of its flowers vary slightly depending on temperature. Thus, it is like having several different orchids in the space of one. The key to developing any orchid collection is to learn about the many kinds of orchids found in nature, and how they grow. Discover the hybridizers’ art in creating unique combinations and decide what you like best and can grow. Ultimately, your orchid collection is unique to your senses and reflects what you like and appreciate. Note: Many of the clones mentioned above are available from Carter & Holmes, Carmella Orchids, and your local orchid nursery.